This is a metal shed that really catches the eye, thanks to its beautifully subtle mountain blue paint scheme, but there’s much more to this metal shed than its good looks. For one, it offers greater storage capacity than you might imagine, thanks to its relatively tall height and the wide sliding double doors. The apex roof also helps here, as well as providing extra protection against the weather. With our climate becoming increasingly damp and prone to storms, it’s vitally important that a garden shed can stand up to it. We have no worries on that score, thanks to the high quality hot dipped galvanised steel that is used throughout the shed on the frame, cladding, roof and gables. It’s thanks to this that the manufacturer has felt confident enough to provide a 20 year warranty against rust damage, which is more than we often see provided with metal sheds. Security is also important, of course, which is why we were disappointed that a padlock isn’t included as part of the standard package. A flooring or anchor kit will also have to be purchased, but even allowing for these additional expenses we still feel that this shed provides good value for money, especially when compared to traditional timber sheds that need to be re-treated every year. 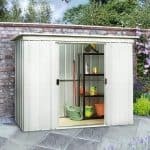 When we review metal storage sheds such as this one, we like those that have paid attention to their appearance and aesthetic appeal, after all it will form a focal point for a garden. We often see metallic silver sheds, and occasionally green sheds, but we rarely see a blue colour scheme such as that sported here. We were very impressed by it, and can see it being very popular with consumers, especially as the paint is so expertly applied and provides extra layers of weather proofing. An apex roof is featured, which we think is the perfect design for smaller sheds thanks to its dual properties of adding extra inches of room as well as causing rain to bounce off the surface. The ridge height of this shed is 1.93m and the eaves height is 1.78m, which means that the shed as a whole is almost a cube and therefore provides a good overall storage capacity. The overall width and depth of the shed are 1.71m and 1.44m respectively. 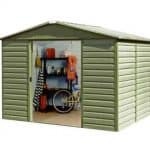 When we review metal sheds by Shed Baron we often find that although the cladding is quite thin and lightweight itself, it creates a strong, stable shed when assembled thanks to the high quality galvanisation to which it has been subjected. This is the case again, although there is one important difference in that this shed’s cladding is slightly thicker than that used in many of their other sheds at 0.30mm, and supported by a frame of approximately twice this thickness. One effect of this is that the cladding is strong enough to have shelving screwed directly onto it, and there are a range of shelving options available to make the most of this. As with all the compact metal sheds we review there is no floor included. 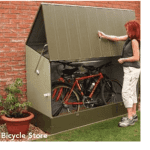 The owner instead has to install it directly upon a flat area of concrete or patio, but to do this they’ll have to purchase a set of fixing screws which unfortunately aren’t included with the shed itself. If you’re new to metal sheds then you’ll be pleased that there is no requirement for annual treatments, in effect meaning you can erect the shed and then forget about it. There’s also no need to worry about the possibility of rust eating into the shed, because the manufacturer has provided a peace of mind providing 20 year warranty. We were very impressed by this, as we often see metal sheds that are only protected by guarantees lasting for 10 or 12 years. We liked the fact that the sliding double doors on this shed were fitted internally. This not only creates a more pleasing appearance, with the sliding rails being hidden away, it also means that the doors are less likely to be damaged by gusts of wind or by accidental impacts. Once opened, the doors are 0.69m wide, which isn’t particularly wide for double doors but is easily enough to get a lawn mower or wheelbarrow through. The door height is a very accommodating 1.70m, and it made a nice change not having to bend down too much when we walked inside. There are no windows, but a plentiful supply of air is allowed in by four air vents positioned on the gable. These also help to regulate the temperature of goods inside, preventing the interior from getting too hot or damp. If preferred, the customer has the chance to add a skylight to let natural light in. 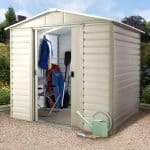 Whilst we can recommend this shed as a compact garden storage facility, it’s not suitable in its current state as a security shed because of its lack of a locking facility. A padlock can be purchased separately, however, and easily attached to the ready holed handles. The lack of windows itself acts as useful security feature, as even if a skylight is added there is no way that passers by, or criminals who are looking for an easy target, can see inside. As well as a padlock, which we would recommend if anything of value at all is kept inside, there is also the option to add a Stronghold ground anchor. This is an inexpensive way to give a great level of security to the shed itself. Other optional extras relate to shelving for the shed. We were pleased that shelving could be screwed directly onto the cladding as this provides a more stable base for small tools and equipment than a stand alone shelving unit. Corner shelves and rear shelves are available in single, double, and triple varieties. We are always impressed with the quality of components provided by Shed Baron, and that’s enhanced in this case by the excellent paintwork and the use of slightly thicker cladding. It’s good to know that the manufacturer is confident enough in the longevity of their materials to provide a 20 year warranty, largely thanks to the water repellent qualities of the galvanised metal. 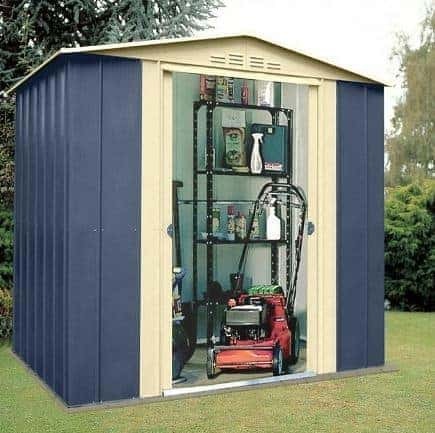 Even though this is a compact shed, the overall volume is increased by the higher roof and eaves, and can be enhanced further with shelving units. Because the shed is both small and lightweight, if stable once installed, it took two of us around three hours to assemble it. Be aware, however, that many parts look the same. We feel this is a good price for an attractive and useful shed, but the value would have been still greater if a flooring kit or anchor kit had been included as standard. Final Thoughts: Your shed will stand out for all the reasons if you purchase this metal garden building in mountain blue. Little things can make a big difference, and you’ll also appreciate the extra inches that are provided by the taller than average doorway and eaves. It means that you’ll find it easy to store taller goods inside, and you’ll also be able to walk in and out without having to worry about bumping your head. We found this shed to be tough and stable once assembled, so it should keep looking good for many years to come, whatever the weather has in store for it.